We’ll help you select and purchase Amish-made portable buildings, gazebos, pool houses, and furniture, metal buildings, and carports. Our advisors walk you through the decision process to ensure that you identify the building best suited to your purpose, property, and budget. Our products are long-lasting, and we believe it is important to look at the immediate and future impact of today’s purchase decision. We believe your experience should be a good experience during and after the purchase. Our staff is knowledgeable, respectful, and here to help you. Our professional delivery teams ensure your building is placed and secured properly for years of enjoyment. 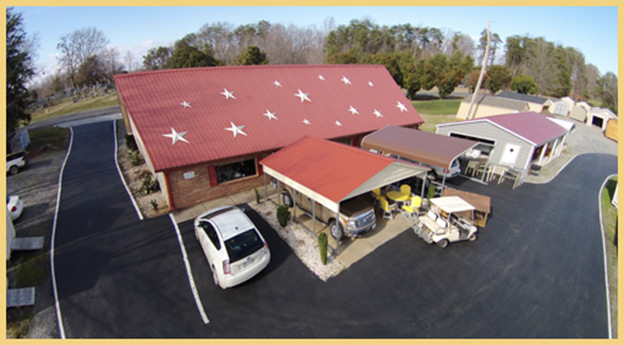 We’ve served multiple generations of families in North Carolina and Virginia for over 30 years. We would be proud to serve yours. John 3:16 says it all. NOT SURE WHAT SIZE SHED TO GET?